Unable to stand the suspense any longer, Lissa went out to the garden and seized the largest squash from the volunteer plant and marched back to the kitchen. It was still green, but she had 14 more on the plant so one could be sacrificed. 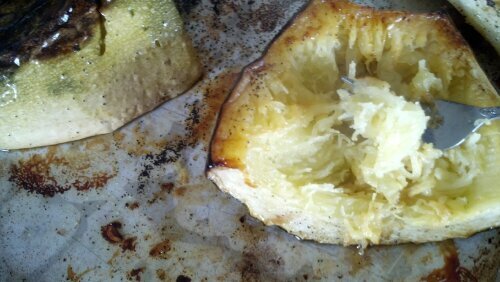 She made quick work of quartering and seeding the squash in preparation to roast, sprinkling each piece with garlic powder and salt and roasting in a 425` oven until fork tender. When it was done, she excitedly took it out of the oven and waited, toe tapping, until it was cool enough to test. Indeed! It was spaghetti squash! Be sure to remember Mom II when you have more than you can eat by yourself! LOL! YUM! We have 15 and counting so I’m sure there will be plenty to share!